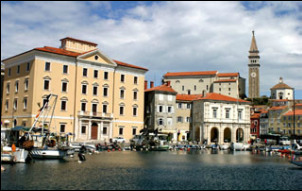 It is the administrative center of the Slovenian Istria and the 6th largest city in Slovenia. The old town center is located on a former island, which has been merged with the coast only in the 19th century. The first settlement of the island dates back to Roman times, when it was located in the ancient settlement Aegida, then the town was renamed into Capris, meaning goats that were grazing on the island before settlement. 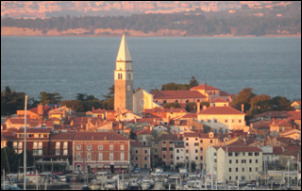 At the time of Byzantium, Koper was called Iustinopolis, and in the 13th century, when it was managed by the Patriarchs of Aquileia, because the role of the administrative center of Istria became Caput Hitriae (head of Istria). At the end of the 13th century, the government was taken over by the Venetians, who ruled until the fall of the Venetian Republic at the end of the 18th century. Venetians have left an indelible architectural mark, which is mainly presented and visible on every step. In Koper, it is worth visiting the old part of the city, whose central part is Tito Square with the town cathedral, where you can climb to the bell tower with a beautiful panorama. You can go and lose yourself among narrow streets with many studios or sit in any of the coastal cafes, which are located on promenade along the sea. Do not overlook the possibility of purchasing a tourist card, which offers a number of other suggestions for viewing and various discounts. More about Koper travel card. 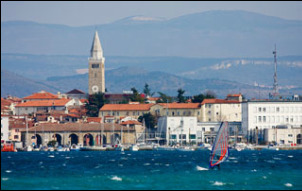 Izola, which was first mentioned in 972, was also the island city. This fact is also apparent from its name, indeed Isola in Italian means island. It was merged with the mainland in 19th century. In the past, residents were mainly dealing with agriculture and fisheries, which has in this town a rich tradition. In the end of the 19th century three factories for canning fish occurred, one of them, which is still working, is wide known Delamaris. There are still numerous active fishermen, which you can meet early in the morning, when they go on the sea. Spreading the town of Izola linked to parts Livada and Polje, and the majority of the population today lives in a residential area Jagodje. Izola has also developed a rich tourist offer. We recommend visit of the beach beside the lighthouse, walk along the narrow streets of the city and stop at the square Lonka, where most of the events take place and there is also a pleasant ambiance of the local bars. When driving towards the center of Izola, in a roundabout you will notice the narrow-gauge locomotive, which was driving on Parenzana. And if you want to know even more about former railway, you can visit Museum of Parenzana in the city center. Admission is € 2. Like most Istrian towns, Piran is also marked by the Venetian architecture. Typical lion, with the book shows that the building was built in the time of peace or war, is present in many buildings. The most familiar attraction is the mighty church of St. Jurij, which was built over the cliff on the Piran peninsula. The development of the village started in the early Middle Ages, mainly because of fertile soil in the hinterland and its position by the sea, which enabled development of the trade. Significant activity was also salt production, which has, due to the method of production and good quality, a great reputation among growers. In Piran you will find many attractions. Aquarium, Maritime Museum, the church of Sv. George, Tartini Square, Punto, remains of Piran fortress walls and museum - Magical World of Shells. You will also be impressed by its architecture and rich offer of fish dishes, which you can indulge in restaurants by the sea. Especially nice is the walk along coastal footpath to Fiesa and back. It is located on the right bank of the Mirna River from where it is extremely beautiful view on its valley. The village has less than 200 residents, but over 20 artistic studios, so many call Grožnjan the city of artists. In the summer it hosts an international film school and an international cultural gathering of music youth. In Grožnjan you can also visit the baroque church of Sv. Vida and see well-preserved Venetian loggia with remaining of city walls. 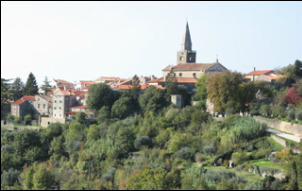 In the written sources the city is first mentioned in 1103, but otherwise it was subject to the same influences as the major part of the rest of Istria. Significant progress in the development of the city was enabled with the Austrian railway Parenzana, which allowed much easier transport of products and thereby speeding up trade with coastal towns. Grožnjan is the highest point of the Parenzana journey. The stopover will convince you to visit terrace bars, located on the walls, where you will enjoy on the sun when drinking coffee and admiring the beautiful idyllic views of Istria. In the richly-equipped studios you can by some of unique souvenirs. Typical appearance ensures that it simply can not be overlooked. 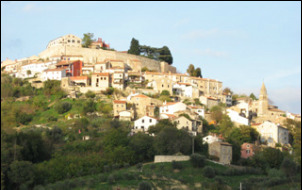 Motovun is located on a isolated hill in Mirna River valley, with a splendid view on the entire surroundings, especially on Motovun forest and Livade village. Precisely because of its strategic position, it played important defensive role in the past and is fully preserved with mighty walls, connected with external and internal corridors between the towers, through which the elements of Romanesque, Gothic and Renaissance style indicates a rich historical past. City is also known because the church of Sv. Stephen with a truncated Gothic bell tower from the 13th century. It also has international reputation, which is achieved especially through a recognizable international film festival, which each year attracts thousands of people. Due to the proximity of the Motovuns forest, you can observe numerous stores with various products from the white and black truffle, as well as numerous restaurants and art studios. Parenzana leads through a tunnel under the Motovun, but we strongly recommend that you climb uphill and visit the city center. The fertile valley of the Mirna River also allows you to visit few agritourisms with vine cellars. Especially famous wines are Malvasia, Merlot, Boronja, Pinot, Cabernet Sauvignon and Teran. The history of the city dates back to the Romans, in the time before Christ. Because of the location by the coast it was easy accessable and a good starting point for the colonization and trade. In the area, there is a red soil (terra rosa), which offerd good conditions for viticulture and the rest Agriculture. A special section in the city history it is a fertile early Byzantine period, when the city has built Euphrasius Basilica. Due to its uniqueness it is included in the list of UNESCO's cultural heritage. Today the city has about 12,000 inhabitants and is a distinctly oriented in tourism. The number of summer tourists often exceeds 100,000. Nearby is a natural attraction, a small island Sv. Nikolas which is more adapted for more luxurious tourists. It can be reached with a boat, so it is a good opportunity to go there for a short walk and to relax. Poreč is also characterized by Roman market Marof and Poreč towers, as well as with the nearby tourist area beaches Blue and Green Lagoon, White Bay and Brulo. You can spoil yourself with a rich variety of seafood dishes. While loosing yourself among many narrow streets, you will notice houses made in numerous architectural styles, as a result of the diverse and rich history of the city. See the presentation video of the city.